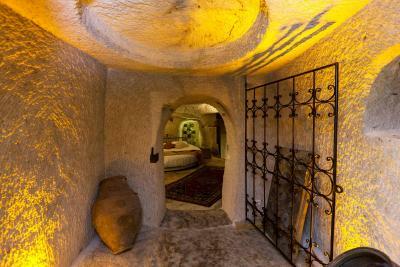 Lock in a great price for Mithra Cave Hotel – rated 8.9 by recent guests! Nothing bad to say. Every thing was amazing. The staff was super nice. They offered us the bathroom when we asked for an early check-in. Great breakfasts. Great location. Superb view. Their dogs were also super cute. 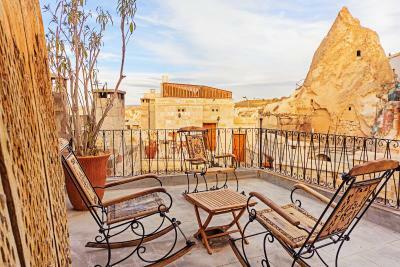 - The outstanding terrace with beautiful decoration - The staffs are all very nice and helpful. 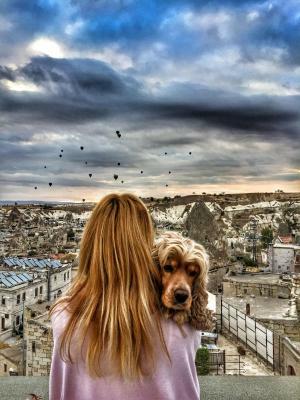 - the location is quite good. Overall the hotel experience was amazing! Couldn't have been better. The location was perfect, walking distance from everything! 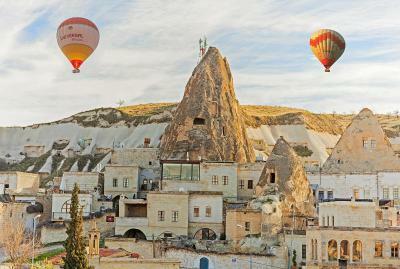 Although we weren't lucky enough to see the balloon because of the unexpected weather, the view was still spectacular! Wonderful location with great view of hot balloons in the morning. 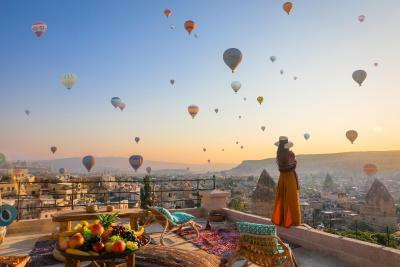 Lovely turkish breakfast, with some changes every day. Well organized and polite staff willing to help. Room is warm in the cold season. Highly recommend! 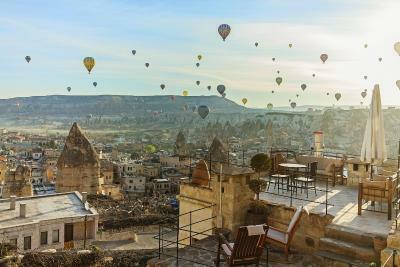 Breakfast was amazing, as was the view from the rooftop terrace! 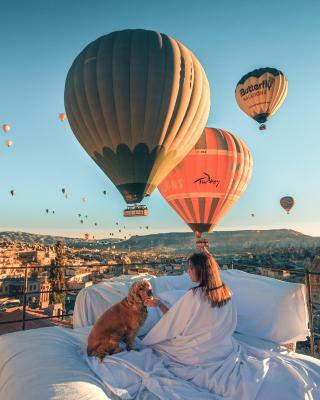 Prefect place to watch the air balloons. The hotel decoration and the service are great. Place and room was nice, especially all staffs member. They're friendly and very helpful when you've got in troble. Thank you very much for very nice service. The food was good, the staff were nice. 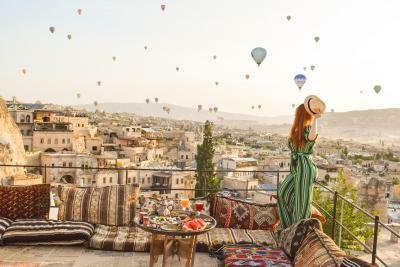 The view from the rooftop is very beautiful. 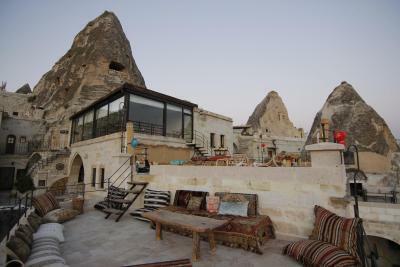 One of our top picks in Göreme.In the heart of Cappadocia, this cave hotel features a terrace with beautiful views of the surrounding villages and valleys. 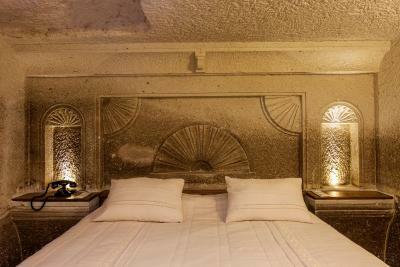 The hotel features authentic rooms equipped with luxurious amenities and free Wi-Fi. 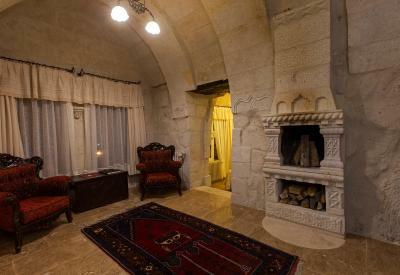 The Mithra Cave Hotel has cave rooms and rooms with Ottoman and Greek style. 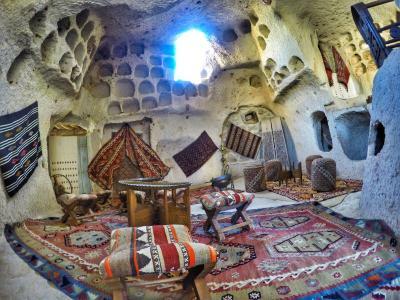 They are all traditionally decorated with handcrafts, carpets and curtains. 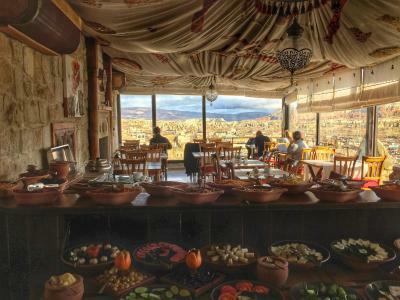 Each morning, a rich breakfast buffet is served at the terrace accompanied with beautiful sunrise. 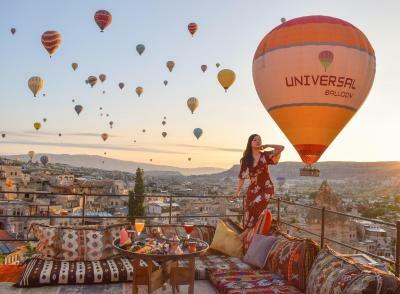 Guests can also enjoy the view of hot air balloons rising over the valley. 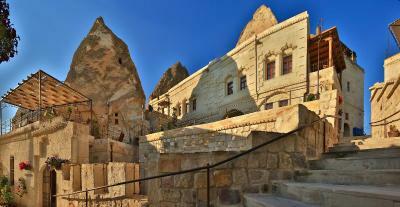 The center of Goreme is only a 5-minute walk from Mithra Cave Hotel. 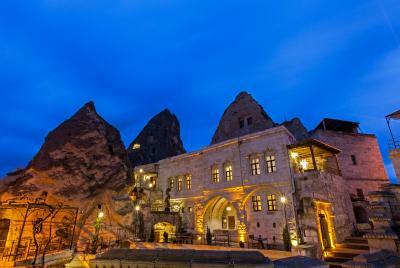 Nevsehir Airport is 25 miles away. 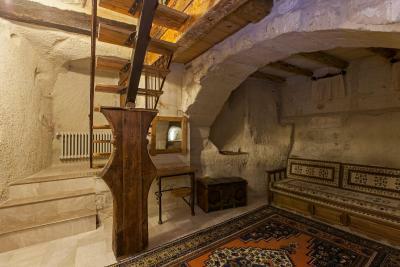 This is our guests' favorite part of Göreme, according to independent reviews. 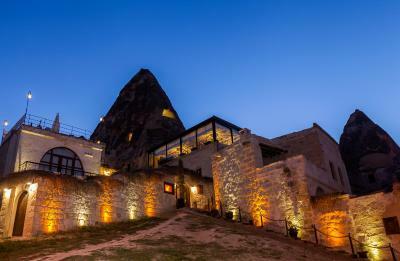 When would you like to stay at Mithra Cave Hotel? 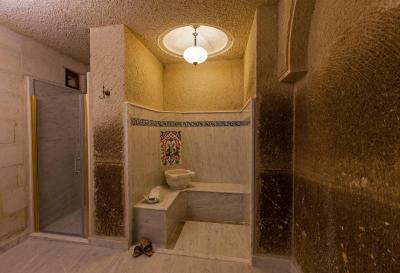 Featuring unique design and architecture elements, this room type offers a private bathroom. You will also find an electric kettle with complimentary tea & coffee setup. 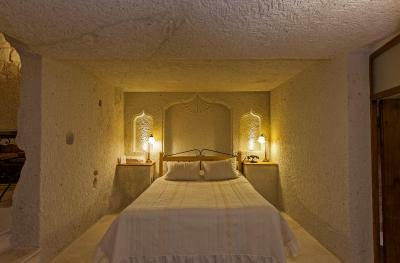 Air conditioning is available in certain rooms. A fan can be provided upon request and it is subject to availability. 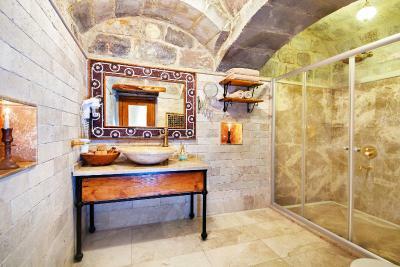 Featuring views of the historical courtyard or the valley, this spacious room comes with a private bathroom fitted with a hairdryer. 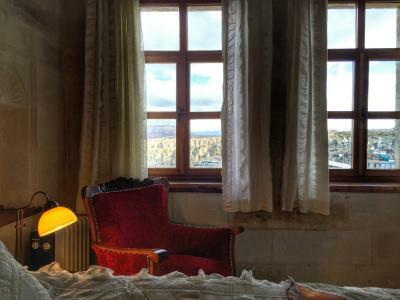 You will also find an electric kettle and complimentary tea & coffee setup in this room. 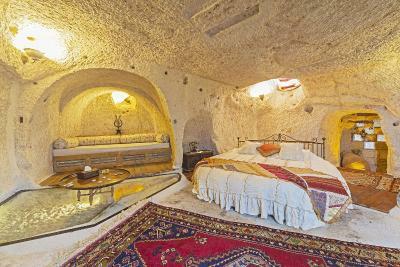 Certain features such as fireplace, round bed or view can be offered. Please indicate your specific preferences in the Special Requests box. Please kindly be informed that these facilities are subject to availability. 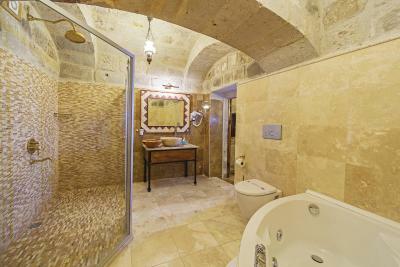 Featuring unique design and architecture elements, this spacious suite offers a private bathroom. 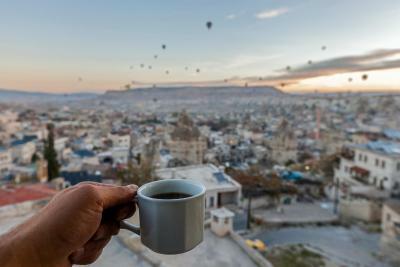 You will also find an electric kettle with complimentary tea & coffee setup. Certain units feature a terrace, spa bath or a fireplace. Please indicate your preferences in the Special Requests box. Please kindly be informed that these facilities are subject to availability. 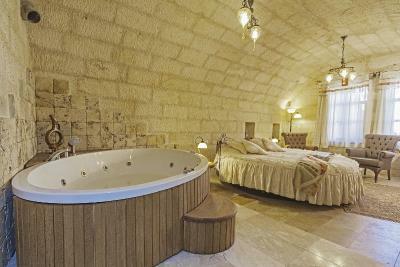 Featuring a round double bed or a French bed, this suite features a private bathroom and a spa bath. 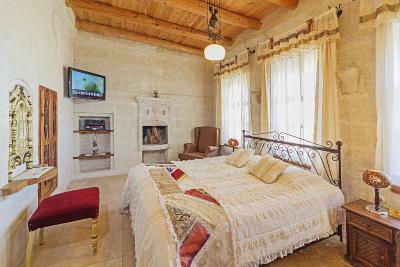 The friendly staff will be happy to decorate your suite for your honeymoon experience in advance. 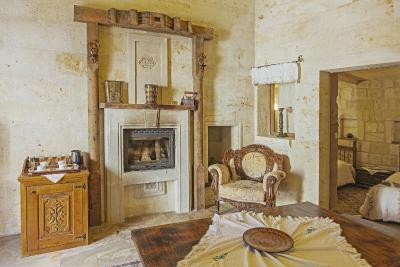 This suite offers access to terrace or courtyard. You can indicate your bed preferences in the Special Requests box. Please kindly be informed that different bed types can be provided according to availability. 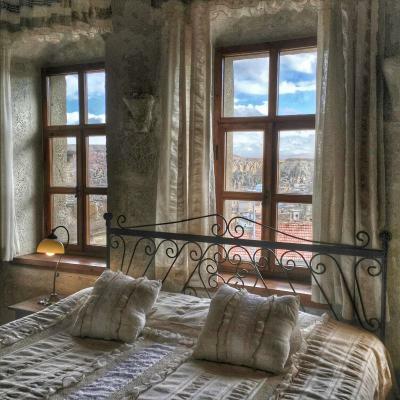 Set in a historical fairy chimney, this suite offers mystical experiences. This spacious suite comes with a complimentary tea & coffee setup for your convenience. 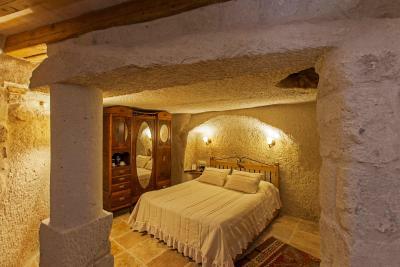 A spa bath, private bathroom and a round bed are also available. Featuring two separate bedrooms, this family suite comes with direct access to the terrace or courtyard. 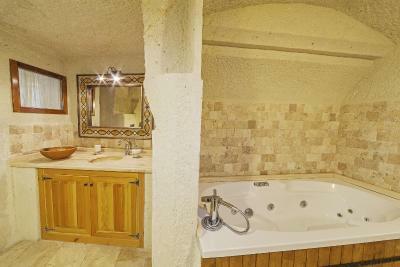 Along with a flat-screen TV, this suite features a mini-bar and a private bathroom. 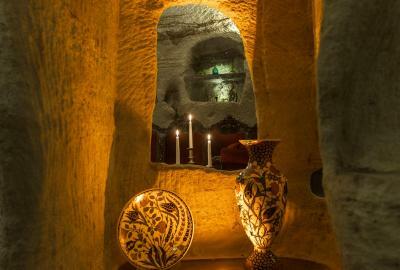 House Rules Mithra Cave Hotel takes special requests – add in the next step! 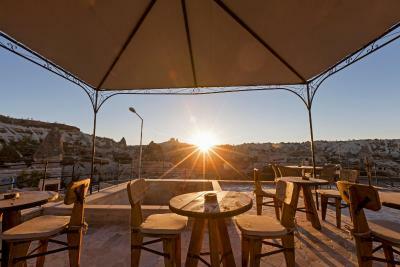 Mithra Cave Hotel accepts these cards and reserves the right to temporarily hold an amount prior to arrival. Please kindly be informed that different cancelation policies are applied for reservations of 3 rooms or more. Please note that the name of the guest needs to correspond with the name on the credit card when booking. 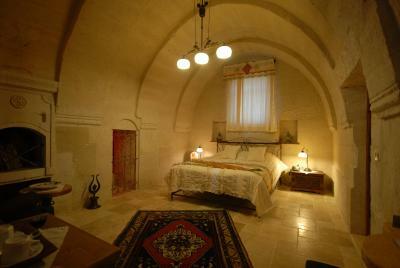 When booking 3 or more rooms, guests are charged the total amount of 1 room and considered as nonrefundable reservation. 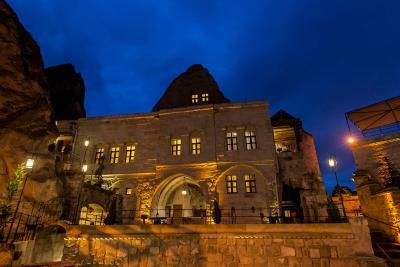 When booking 5 or more rooms, guests are charged the total amount of 2 rooms and considered as nonrefundable reservation. 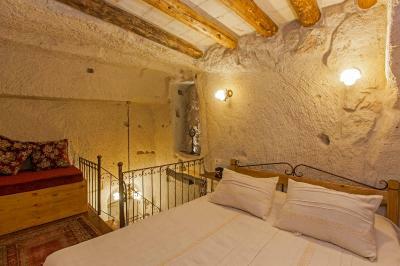 Clean and modern hotel with popular point of interest within walking distance. Staff are friendly, helpful and always smiling. 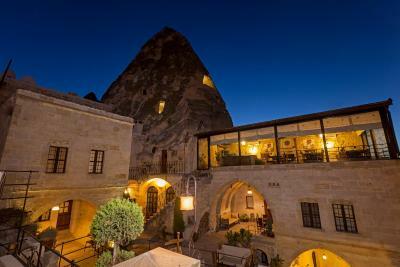 I was really quite disappointed with this hotel having had high expectations and considering it is more expensive than most other hotels in Goreme. The breakfast was possibly one of the worst breakfasts we have had in a hotel...chips and greasy sausages with some dry cakes is not exactly what we were expecting. The bed wasn't very comfortable and there was an overpowering smell of air freshener that we couldn't figure out where it was coming from. The staff were also not particularly friendly or warm (there was only 1 guy who was smiley and helpful)- everytime we asked something it was like we were putting them out. 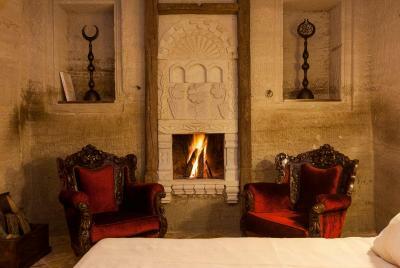 Unfortunately due to the weather we were unable to use the terrace however I am sure this is beautiful and is after all the main reason people book this hotel. 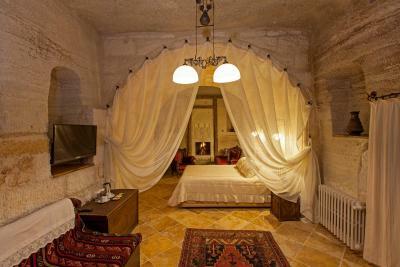 The location was convenient and check in and check out was very easy and stress free. It was quite expensive, does not really worth that much. The room was quite dark with few lights. The room was really large and the staff was friendly and helpful. Suitable for balloon shooting. 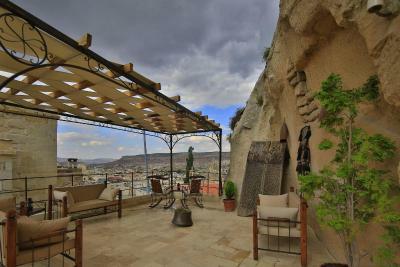 The terrace is so beautiful with cappadocia view. Breakfast is very good. Unhelpful staff 1.cancle the booking by saying that the card is unable while the card is ok 2.not trying to help with the rebooking saying words" if you dont believe me go check the web site yourself! 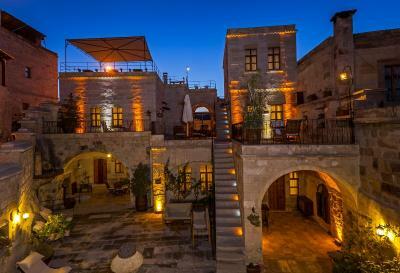 !We were fully book now" and yes we did find it without any help from the staff. Remark* using the same credit card that they told us that they couldt use it!!. The most dissappoint part was the way staff talking to us. With any willing to help and bad tone. 3.We had to wait more than 10 minutes for the staff to come and pick up our stuff then the same staff not giving us the room key because we're giving him tips. What kind of manner is that?? This is the only hotel ever that staff trying to stay in your room longer just to force us to give him tips!!! Too crowded since the hotel is very popular and they have many rooms compare to other hotels so you have to wait to get the photo spot. The terrace decoration is worth it. 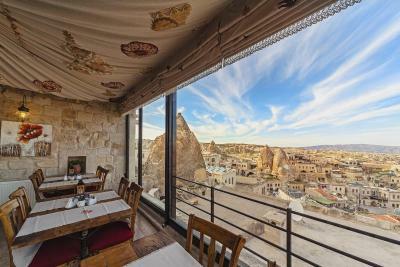 I’ve stayed in other hotels in Goreme but I gotta say I got the best terrace picture here. The restaurant for breakfast was small and crowded. The bath tub wasn’t very clean. The family room we stayed in was spacious and comfortable. The staff very helpful. The facilities were amazing and the view was stunning. 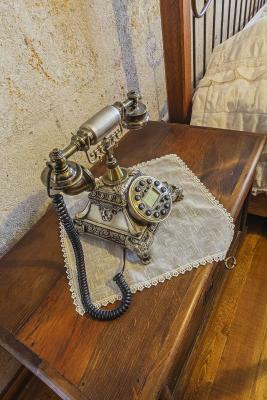 Being able to plan tours through the hotel was helpful.